Accurate, timely data is critical for a customer-facing organization. At the National Insurance Board of the Bahamas (NIB), it also serves as a management tool. Many organizations rely on historical data to make decisions. This decision-making methodology uses point-in-time information including sales revenues, average selling prices and numbers of customer-service calls. To support the business, talent leaders historically submitted metrics about employee attrition, dollars spent on training classes and health care costs to help determine future spending. This information is important to the decision-making process, but not complete. The ability to gather feedback quickly from all stakeholders — customers, employees and leaders — on an ongoing basis can help an organization adapt programs to ensure increasing sales, profits and happy customers. The NIB has developed a competency model around customer service and has been collecting feedback for the past three years. NIB, with 500 employees, is charged with administering the social security program in The Bahamas and providing income replacement due to sickness, retirement, death, industrial injury, disease and involuntary loss of income to the nation’s approximately 300,000 residents. When Cargill came on board in 2008 the organization was without a chief executive, morale was low and there was a need for leadership development in all areas. Customers also thought there was a very low level of customer focus and employees needed customer service training. Cargill was determined to home in on the strengths and weaknesses of the team, understand where they stood on the road to success and provide solutions for all identified gaps. The NIB leadership team discussed ideas for organizational success and developed a competency model around the customer experience, including a focus on knowledge, training, problem-solving and supervision. To have a well-rounded understanding of the business, NIB collected three types of real-time survey feedback: employee opinions and perceptions, individual leader feedback and customer feedback. In 2008, NIB began collecting data in all three areas from internal and external customers to improve service delivery. The employee satisfaction survey and 360-degree leadership assessments are deployed at different times of the year, while customer feedback is collected on an ongoing basis and reported quarterly. The employee opinion survey is used to identify key issues that impede innovation, find out how customer service can be better and improve problem solving and management team effectiveness. Questions are organized into areas including communication, customer service, supervision and training. All employees are urged to participate online anonymously via emails from Cargill, and typically 65 percent do. 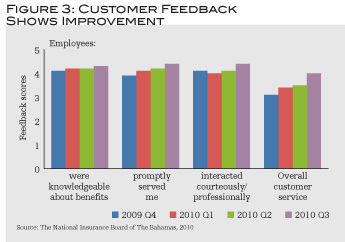 Favorable scores increased from 2008 to 2010 (Figure 1), and there has been improvement in each topic area: customer service (26 percent); communication (24 percent); and management (20 percent). In 2011, the company held a series of seminars called Festival in the Workplace (FITW) to improve service excellence and encourage employees to go beyond the call of duty for internal and external customers. In this forum, employees can speak openly about how they feel, what they would like to see happen within the organization and ways to add to positive change. 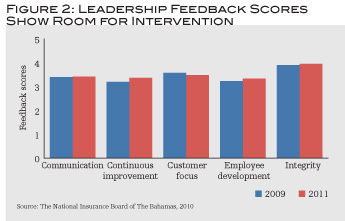 NIB Bahamas also implemented annual 360-degree feedback deployments during the past three years. The executive team has collected information on communication, continuous improvement, customer focus, employee development and integrity from managers, peers and direct reports (Figure 2). The results are discussed with each individual and a roll-up report is provided to illuminate the entire team profile and identify new training opportunities. While there have been some improvements over time, employee survey results indicate this is an area for continued intervention. As the NIB leaders focus on and increase their competence in these areas, the impact will show in customer and employee feedback results. NIB collects customer feedback regularly to determine customer attitudes about employees’ responsiveness, knowledge and professional demeanor. Survey data is collected online and via hard copy; NIB customers who have visited an office or called in for service are requested to provide feedback. At the beginning of this customer feedback process, the survey design concentrated on understanding the customers’ profile and their input on their customer experience. Questions that helped to profile customers included the type of customers, why they contacted NIB and what branch office they visited. Customer experience questions ask how knowledgeable, responsive and professional the staff was, as well as solicit feedback on the overall customer service experience. Figure 3 shows an overall increase in satisfaction in all four areas during the two-year time period when this iteration of the survey was in use. Ideal Customer Experience (ICE), a program developed in 2009, is one of the reasons there has been continuous improvement. In designing ICE, a series of steps was identified that led to the ideal customer experience. These include surveying customers, developing the NIB vision, building a stronger management team, communicating the vision, training, mentoring and coaching and empowering employees. Based on these steps, expectations were set for the ICE program around reliability, responsiveness, knowledge and professionalism. All employees attended training focused on improving the experience for external and internal customers. After the program, which received favorable reviews in a subsequent employee feedback survey, training coordinators made site visits to observe employees in action and see if they were courteous, responsive and knowledgeable. If there were gaps in the employees’ skill level, the local office manager made provision for the training department to address the gaps. Ongoing service training programs continue for current and newly hired employees. • Many customers had taken the first survey several times and NIB thought some might not want to keep taking the same survey. • NIB managers thought they had a good understanding of the customer profile. • The design of the updated survey came from information collected from the previous survey, so NIB can collect more quantitative information in specific areas. • NIB wanted to shorten the survey to increase response rates. In addition to asking customers to rate their satisfaction in six specific areas, NIB also asked about customer expectations in those same areas. With this data, NIB can understand customers’ expectations, review the gaps between their expectations and actual performance and determine how to prioritize resources, training and communications in specific ways. In both iterations of the customer survey, respondents are asked which local office and department they visited. The training department works with the local office to target additional training in specific areas. Since the managers are included, there is collaboration and accountability brought into the process. The collection of feedback, analysis of data and action-oriented program interventions is not a one-time event, but a process that is integrated into the strategy, process and programs of the organization at all levels. So while the customer experience has been significantly enhanced, there is more room for improvement, especially a more direct focus on managerial skills and competencies that will have a positive impact on customer experience metrics. “This commitment to service continues to be a process with a focus on continuous improvement; the coordinated effort of gathering all three types of feedback provides us with the gift of data that is helping us put in place those processes and measure the results,” Cargill said. Marcie Levine is CEO of SurveyConnect, a provider of 360-degree feedback, people performance assessments and survey technology. She can be reached at editor@talentmgt.com.